The International Space Station Through the Eyes of Little Earth! Greetings fellow Earthlings! 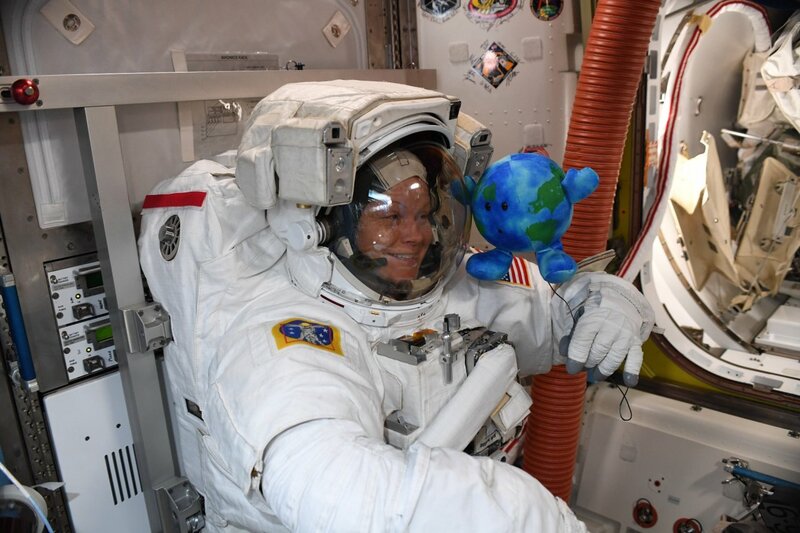 Curious about my first week on the International Space Station? What does a normal day look like when you’re living and working hundreds of miles above Earth? Take a look at some photos from my first week, when I was still learning the ropes from my new roommates! Talk about a warm welcome! 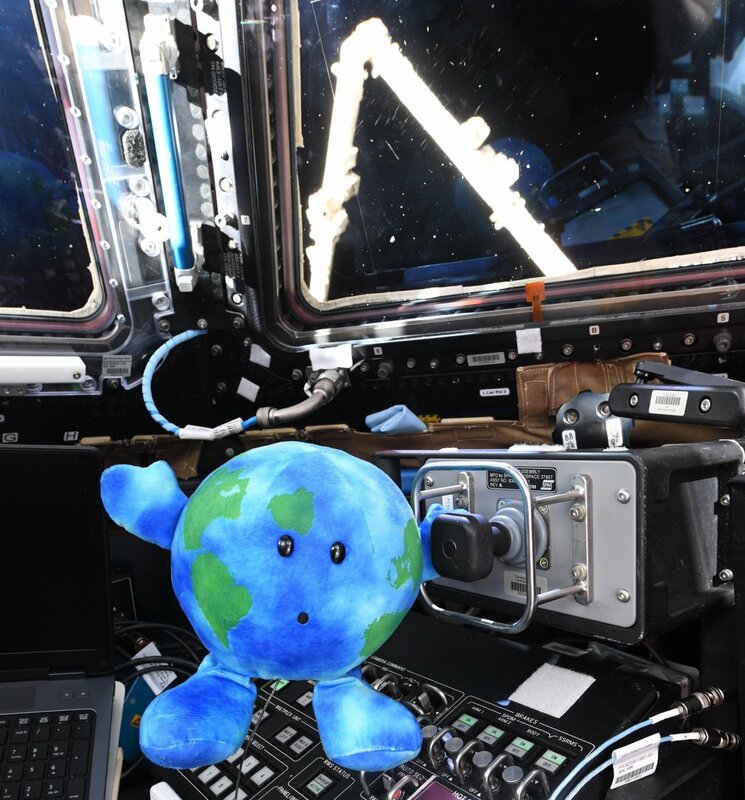 I arrived on March 3, 2019 when the SpaceX Crew Dragon docked to the Space Station for the first time. This historic mission marked the first time a commercially built American spacecraft intended for human spaceflight docked to the orbital lab. 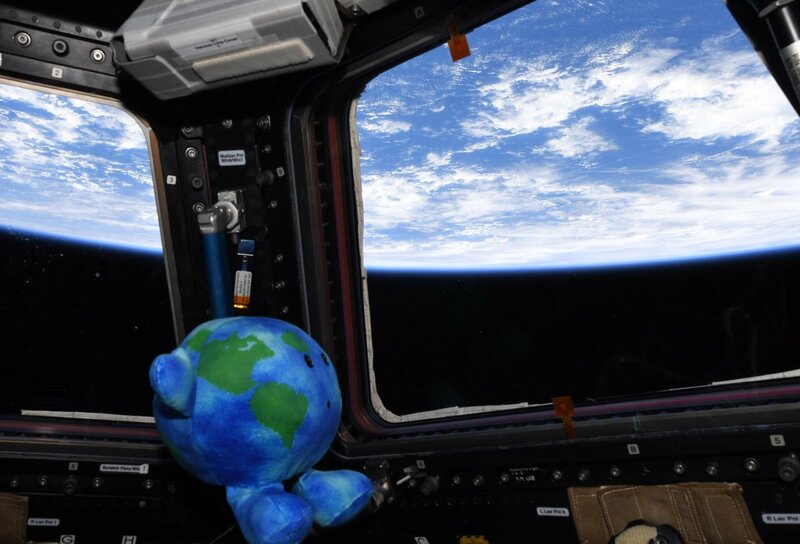 Though un-crewed, Dragon was carrying two very important passengers – my space travel companion Ripley and myself, Astronaut Little Earth. During my three-day introduction to the station, two Expedition 59 astronauts, Anne McClain and David Saint-Jacques, taught me what it takes to be a Space Station crew member! First thing’s first – the VIEW. 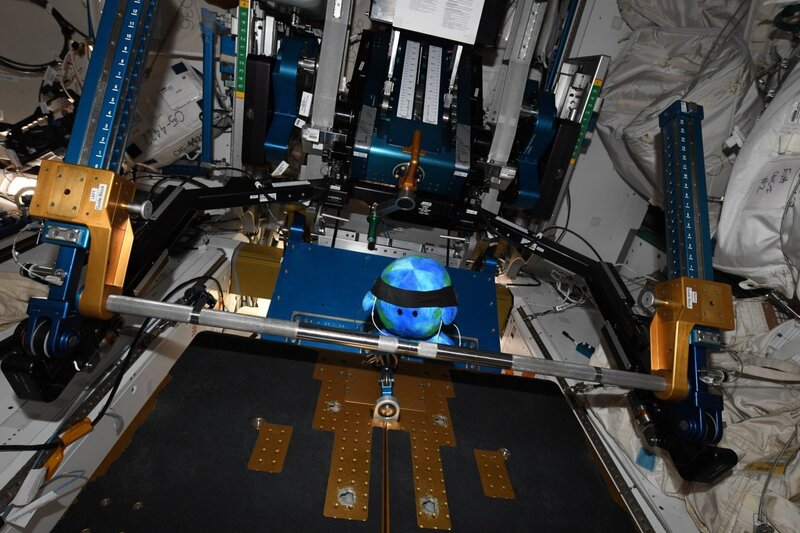 After the traditional hatch opening welcome ceremony, I was off to the Cupola Observational Module. Designed for the observation of operations outside the station, this module’s six side windows also provide spectacular views of our Mother Earth! My roommate Anne McClain introduced me to the beautiful vantage point of space. Clearly, I was a little star-struck. Next, it was time to get to work – lending a hand with Anne McClain’s space suit sizing. Did you know you actually grow in zero gravity? Astronaut McClain has grown two inches on her current mission in space. Crew members must account for this change in growth to know if different components need to be switched out of their individual spacesuit for a better fit. When pressurized and filled with oxygen, the spacesuits become stiff objects around the astronauts inside, making it critical they fit comfortably. These spacesuits are essentially mini spacecraft that provide protection and a means of survival for the astronauts as they venture outside the space station and into the harsh environment of space. One Café Latte, please! I was thrilled to find out that even in space, the morning begins with a pick me up. 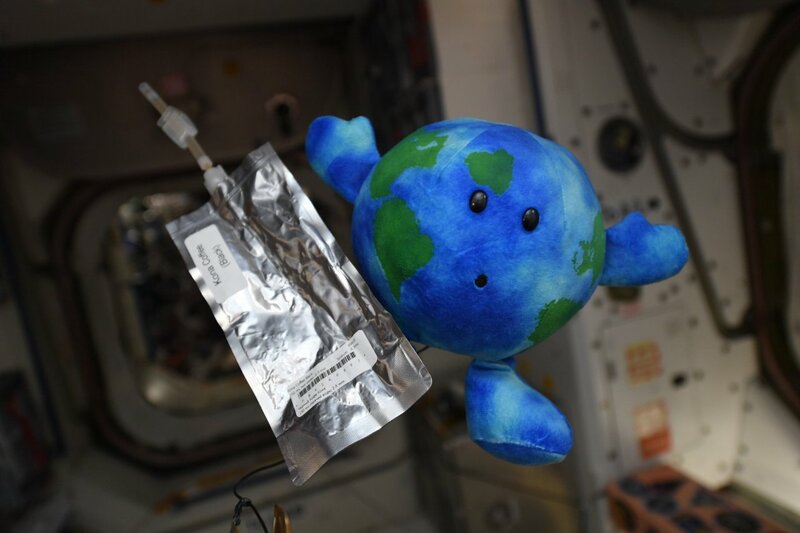 Due to microgravity, liquids tend to get sticky and cling to the wall of cups, making these plastic pouches and straws necessary for consumption. Astronauts in 2015 got an upgrade to their morning cup of joe thanks to SpaceX, Lavazza and the Italian Space Agency. Named the ISSpresso, a microgravity coffee maker has brought authentic Italian espresso with zero-G coffee cups onto the International Space Station. Fueled up and ready for the day, my next agenda item was emergency preparedness practice. There is no 9-1-1 in space, and three events that could pose a dangerous threat to the Space Station include a fire, a depressurization event or an ammonia breakout. 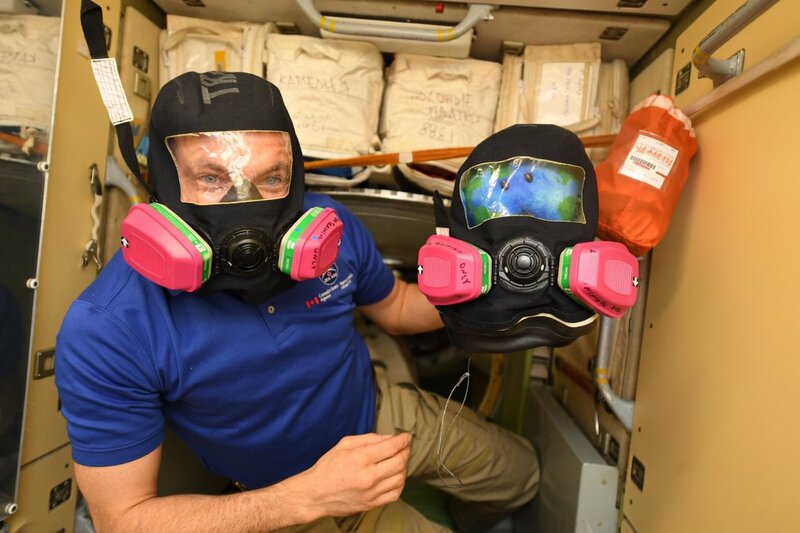 Here, Canadian Astronaut David Saint-Jacques and I practiced emergency mask donning in the unlikely event of an ammonia leak into the station’s atmosphere. From astronaut to astro-plumber, I traded my mask for goggles with Astronaut Anne McClain during a briefing on plumbing routine maintenance. 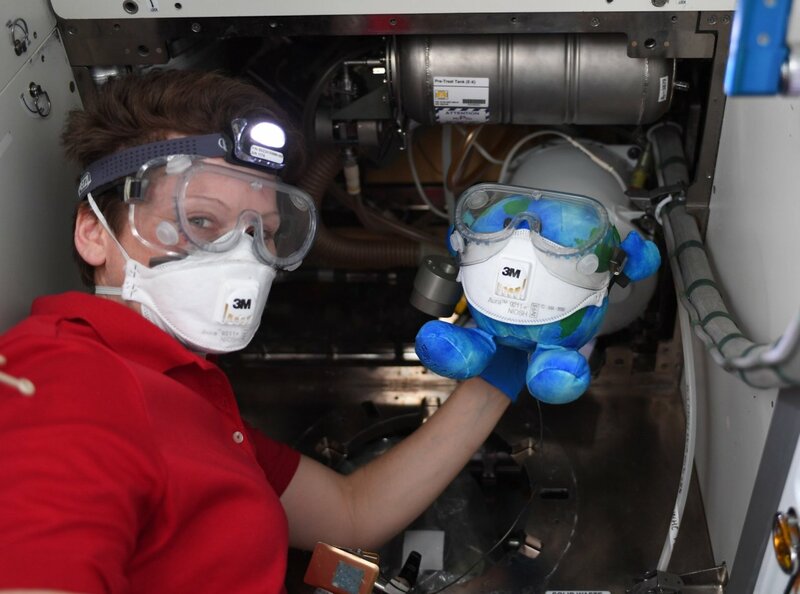 Because the International Space Station never returns to Earth, the crew is trained to regularly inspect, replace and clean parts inside the station. Talk about staying healthy! After a busy day, Astronaut McClain and I continued to hit the ground running, literally. 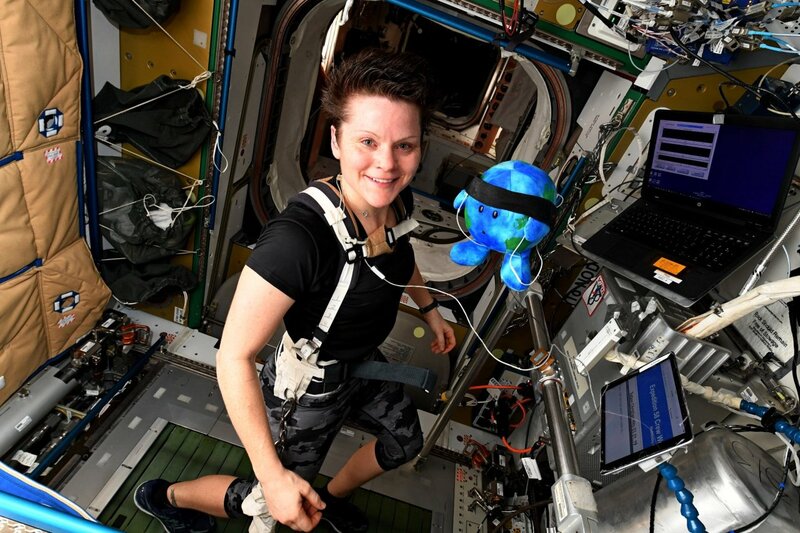 Crew members are required to work out daily for about two hours to help keep their heart, bones and muscles strong in zero gravity. The harness McClain is wearing is very much like a backpacking harness, designed to evenly distribute weight across her upper body and is attached to a system of bungees and cords. Depending on the tension in these attachments, a specific load of pressure is applied to her body onto the machine. Watch out, deadlift going on. Running isn’t the only gym exercise they have onboard; strength training is also incorporated into the daily exercise regime. You can look, just don’t touch they told me. Whoops. This was a definite highlight, my Canadarm 2briefing. That black nob by my hand is the translational hand controller. It operates the up and down function of the 57.7-foot-long robotic arm. The Canadarm2 lends a literal helping hand with many station functions, using a “hand” known as a Latching End Effector to perform tasks such as in orbit maintenance, moving supplies and performing “cosmic catches”. Whew, you work up a big appetite working on the Space Station. Ending the day, I was introduced to a crew favorite, group dinner! 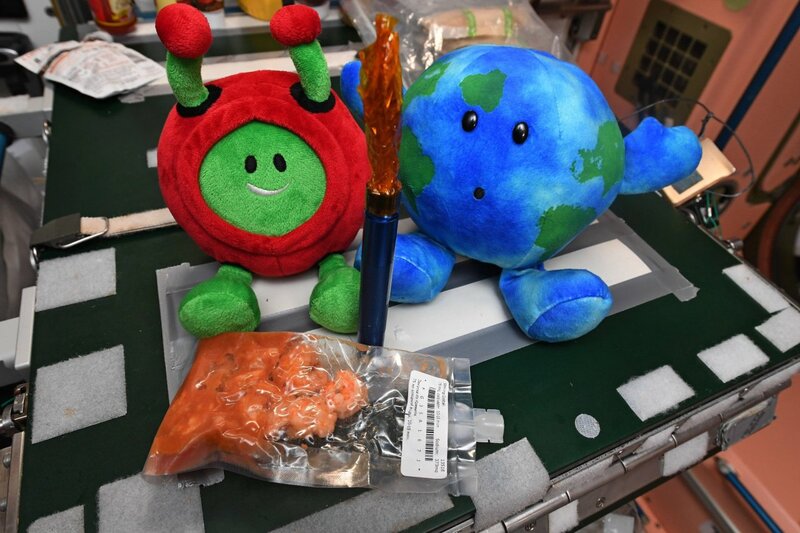 Astronauts and cosmonauts from around the world come together on the orbital lab and bring with them a variety of cultures and … food! Though each country is responsible for feeding its own members, when on board the astronauts can share as they please. A new friend of mine, Paxi from the European Space Agency, welcomed my visit and we split a delicious space-shrimp cocktail. And that’s a wrap to a busy first week aboard the International Space Station! Learn more about what it means to live and work aboard the International Space Station, and click here to see if you have what it takes to become a NASA Astronaut. Until next time!